Post Traumatic Stress Disorder or PTSD. We hear a lot about it, but what is it and what can we do about it? By definition: A mental health condition triggered by or experiencing or seeing a terrifying event. So why do we hear so much about it today? 12 years of war. PTSD is not new. It has been around forever. We are just starting to understand it and in doing so we are learning how to help people with PTSD cope. Our brains are very amazing computers. When you go throughout your day, all of your experiences are in an active file. When you go to sleep your brain processes those events and moves them into the memory files. When someone sees or experiences an intense or traumatic event, your brain stores it in an active file. When you go to sleep you are startled because of that experience and are woken up. That event was not able to get processed. Maybe the next night you’re able to get that experience processed. So our veterans are seeing and experiencing so many terrifying things that they can never get them processed. Sleeplessness is very common among our veterans. Eventually without being able to rest and re-boot their brain, a lot can happen; a lack of focus, no motivation, fatigue, drug/alcohol abuse and possibly suicide, to name a few. 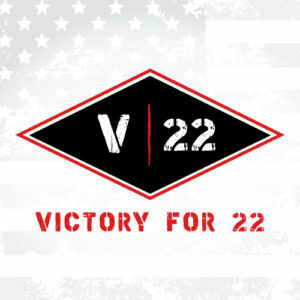 22 veterans a day are committing suicide because of PTSD. 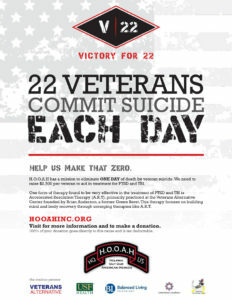 HOOAH is going to help eliminate 1 day of suicides for our veterans! HOOAH needs to raise $55.000.00 to get 22 veterans treated for PTSD, using the Accelerated Resolution Therapy (ART) process. Primarily at the Veterans Alternate Center in Holiday Florida. Veterans Alternative Center was founded by Brian Anderson a former green Beret. The Center focuses on building Mind and body and recovery though emerging therapies like ART. ART is being utilized at Ft. Belvoir, Walter Reed Army Medical, Ft. Benning and in the Ranger Performance Enhancement Center. In a very basic explanation, ART helps the brain process the experiences in those active files and gets them moved to the memory files so the brain can reboot and the veteran can rest and heal. It combines relaxation with imaginal exposure and helps move those temporary memories to long tern storage. With the support of Dr. Diego Hernandez, a Licensed Clinical Psychologist and Clinical Director of Military and PTSD research at the University of South Florida College of Nursing. Help in determining those who are in need of ART and HOOAH will be covering the transportation, lodging and treatment expenses for the veterans. Dr. Diego Hernandez has been leading the way with ART, with great success, in helping with PTSD. Traditional coping and drug therapies are NOT working. So please join HOOAH and Dr. Diego Hernandez in getting our veterans the treatment they have not only earned but also deserve. Your donation is tax deductible and HOOAH is a 100% volunteer organization!